Sometimes what we’re doing feels so tiny compared to the person beside us. Maybe it’s changing diapers. Maybe it’s sitting beside a loved one while the hours pass. Perhaps its working in a cubicle doing the same task day in and day out. Or maybe it’s even being the janitor at church instead of the worship leader on stage. Whatever it is, we can all at time feel like our contribution is insignificant. But God sees it. Better yet, he rejoices over it. Because sometimes the smallest things make the biggest impact. 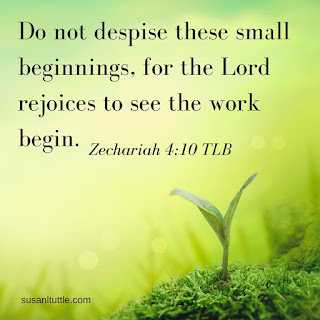 We all start small, and yet from the moment of our conception we are of the biggest value to God. Our size doesn’t matter, we do. And it’s the same with whatever we are called to do. 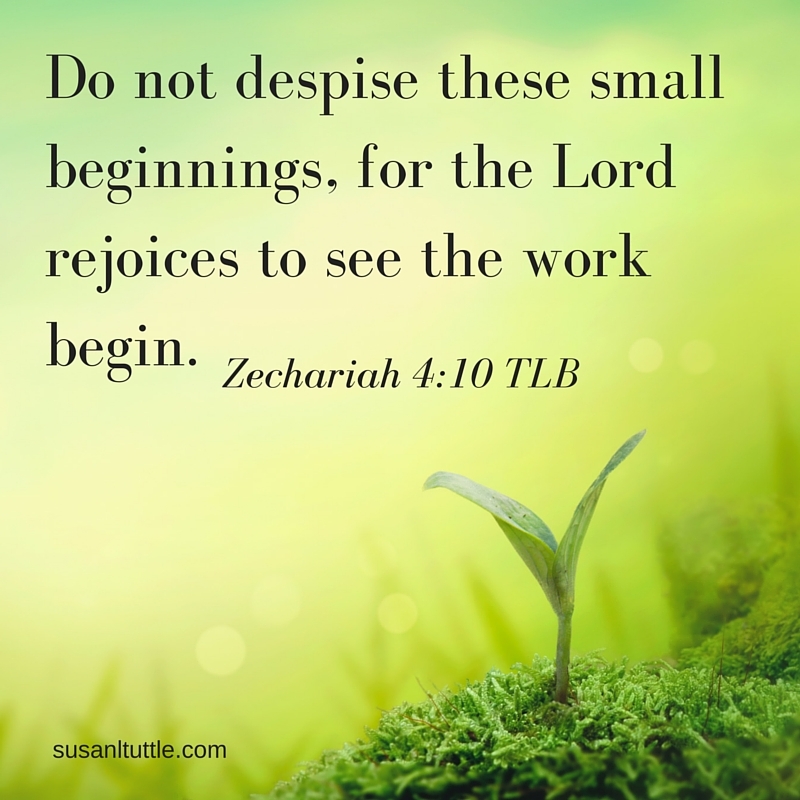 Our walk toward the purpose he created us for must begin somewhere. Oh, don’t despise the first steps! Don’t begrudge where he has you now. And don’t miss the power of your obedience in simply being there. God sees it and he cheers over it. If you are in God’s will, no matter what task you are doing right now, it matters. You matter. It’s all part of the story he’s writing for you. Don’t give up. Know that small steps lead to big things—don’t miss a single part. Lord today let me see the importance of where you have me, and help me find joy in the moment. Let me stop comparing to others and devaluing those things which you have called me to. Big or small, it is all part of who you are creating me to be. Help my value to rest solely on you and not on what I do. Amen. Good morning Susan. Thank you so very much for this post. I really needed this. I'm wondering if I can share this on my blog? I've always loved this Scripture and your insights are perfect and timely for me.